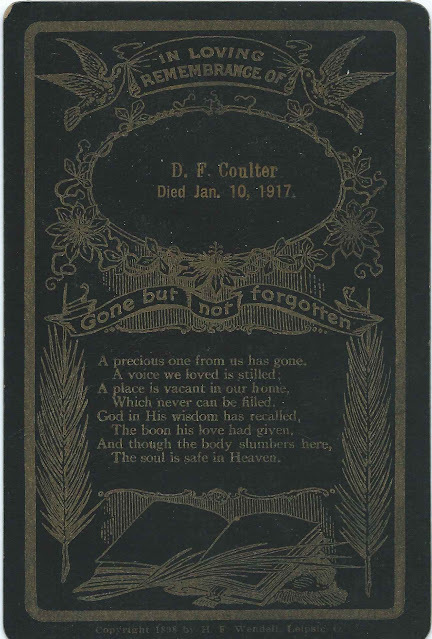 Memorial card printed by H. F. Wendell of Leipsic, Ohio, on the occasion of the death of D. F. Coulter on January 10, 1917. If you are familiar with a D. F. Coulter who died on that date, please leave a comment or contact me directly. Interestingly, there was a Daniel F. Coulter who died of pulmonary tuberculosis a week later on January 17, 1917 at Bristol Township in Morgan County, Ohio. There's a contemorary Bristol Township in Ohio, but it's in Trumbull County. Presumably the Bristol Township in Morgan County is now known as something else. Daniel was born April 18, 1853 in Ohio, the son of Charles Coulter and Content (Morey) Coulter, born in Ireland and Maine respectively, according to Daniel's obituary. Daniel married Sarah Ann Dean and had at least one child, daughter Elizabeth, who was presumably the Lizzie C. Macklem, who was the informant on Daniel's death certificate. Daniel is buried in the Bristol Cemetery in McConnelsville, Ohio, in Morgan County. Perhaps the date of death in the memorial card is in error?